A microfilter performs two main tasks. First, it prevents high frequency noise from appearing at the telephone and potentially decreasing voice quality. 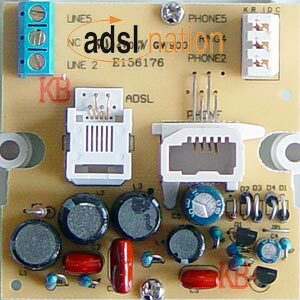 Second, it prevents the telephone equipment from interfering with the modem by preventing harmonics, overtones and changes in impedance caused by the telephone equipment. Not all filters are equal. Below are some pictures of the components inside some popular UK microfilters. The most advanced UK microfilter. 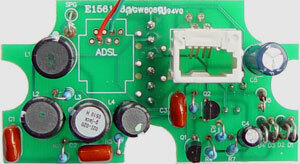 The XF-1e uses transistors to actively remove the ADSL signal from the telephone equipment. The filter contains the most components used in any UK filter, the extra components are used to refine the frequency separation. A very common microfilter in use in the UK due to it once being the standard issue from BT. Manufactured by Excelsus and also rebadged as Thompson SpeedTouch. An interesting filter, the only filter other than the XF-1e we have found that has a transistor based design. looking closer at the design it seems to be overly complicated and didn't achive the accurate seperation required. 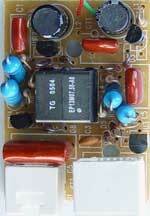 This filter has a 1uF ring capacitor that may cause ringing problems with some phones. This is the face plate that can be fitted to the standard BT NTE-5 master socket. Designed to run all your phones from one central filter. To support the full 4 REN it has a large 1.8uF ring capacitor. 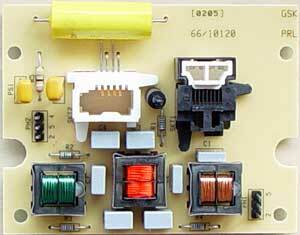 This is the face plate as installed by a BT engineer. Designed to run all your phones from one central filter. To support the full 4 REN it has a large 1.8uF ring capacitor (the yellow one at the top). The XTF pre-filtered telephone sockets are available in 62 & 80mm versions. Contains XF-1e filtering, using transistors to actively remove the ADSL signal from the telephone equipment. The filter contains the most components used in any UK filter, the extra components are used to refine the frequency separation. Quite a good filtered telephone socket considering it's low price. With filtered phone outlet and unfiltered RJ11 outlet for ADSL. Can be used to run all your phones from one central filter. To support the full 4 REN it has a large 1.8uF ring capacitor (the red one on the top left). Not exactly a socket but a hardwired filter in a standard size box that is often used for alarm systems. 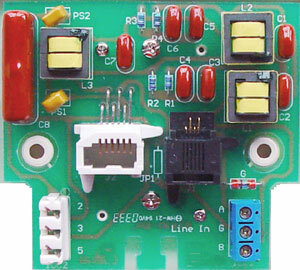 The circuit is a simplified version of the Pressac ZUK-BT in-line filter near the top of the page here. This is a simple telephone socket with a built-in filter. The filter circuit is an ASL 2019 the same as their current plug-in filter. 2 surface mount capacitors are bonded on the underside of the PCB to make a 1uF ring capacitor so technically this should be 2 capacitors in total. Excelsus are a long established name in ADSL filters and this filter has a reasonably good circuit design for a small plug-in filter however it falls flat on it's face due to the fact that the filter does not filter the ring line or provide it's own ring signal. This filter has the ring connection incorrectly wired straight through from the unfiltered line. The ring signal from the line should not be connected as the filter should provide it's own ring signal using a ring capacitor. This filter will cause serious problems on telephones that make use of the separate ring signal. It does not come anywhere near meeting the BT SIN 346 standard and was designed for the Hong Kong market. Reported to be sold by ebuyer at the moment. ebuyer were selling the solwise v1 design untill recently, but places like ebuyer tend to have whatever they can get the cheapest at any given time and at the moment it seems to be this one. This filter has the ring connection incorrectly wired (green wire). The ring signal from the line should not be connected as the filter should provide it's own ring signal using a ring capacitor. You can improve the results by cutting the green wire if you are feeling brave. Claimed to be BT SIN 346 Compliant but clearly not ! Unknown Brand - Falsly sold as D-Link DSL-20MF by some retailers ! Surprisingly this unknown brand filter has been sold as a D-link filter. This filter has a significant design flaw. The ring signal from the line should not be connected to the filter. The filter should provide it's own ring signal using a ring capacitor. This could signal the beginning of a worrying trend of retailers not delivering what you pay for. 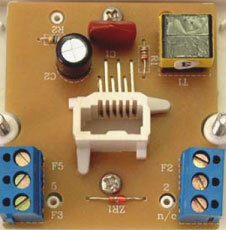 The real DSL-20MF is an external box with small wire design, not a plug-in module like this one. If you recieved this filter when ordering D-Link filters demand that they are replaced. Because even though cheap filters are not 100% they are often adequate for many applications. As a supplier of ADSL equipment we have received many filters from manufacturers claiming to be UK compatible but almost all of them fall short of that claim. We have developed a star rating to help people better understand the capabilities of each filter as follows. 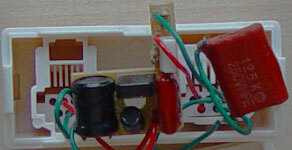 The worst are US types that often have significant design errors such as no ring capacitor. They can just about work with basic phones that you don't need to ring but best avoided as they are likely to cause serious degradation of line quality. Fortunately filters in this category are becoming hard to find. 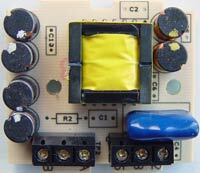 Low cost filters usually modified US or Chinese design with a ring capacitor added. Usually this capacitor is inadequate but will work with some basic phones. Filters made for the UK with a little more thought gone in to them than the other 2 but still using a minimum number of components to keep costs down, this can cause variations in performance depending on equipment in use and can have problems with difficult to drive loads like some DECT phones. Filters in this category are now the most common filter sold by most retailers, also sold on eBay by several traders. These filters are designed for the UK market, use good quality components and have a high capacity ring capacitor. These have been well tested by the specialist ADSL outlets that sell them and may well be tested and approved by BT using their SIN 346 specifications. They generally work well with a majority of equipment including DECT phones. They still generally have problems with a small amount of equipment such as high powered ringers, caller display units and PABX systems. Maximum compatibility & performance. If your equipment does not work with a 5 star rated filter then you are unlikely to get it working as you almost certainly have a fault with the equipment or line. Currently the XF-1e Professional microfilter is the only one that we have given a 5 star rating to. You would be forgiven for thinking that's just because it's our filter, but the truth is that we have given it this rating because it really is unbeaten for compatibility. With the XF-1e we are setting new standards for compatibility that we hope others will follow and even exceed in the future. We would be happy to see this category grow and the others shrink as improvements are made to filter design. Half stars are given where a filter performs better than others in it's category but not quite enough to meet the criteria for the next category. The easy way to use the star guide is that the lower the number of stars the higher the probability of problems caused by the filter being inadequate.